Last Wednesday I went to MMACA (Museum of Mathematics of Catalonia) with some of my students. This museum is located in Mercader Palace in Cornellà de Llobregat (near Barcelona) since February and we enjoyed a very interesting “mathematical experience”. For example, students could check the validity of theorem of Pythagoras in two ways. First of all, they coud weigh wooden squares and check that the square constructed on the hypotenuse of a right triangle weighs the same as the two squares constructed on the other two sides of the triabgle. Later, they discovered that the first square could be divided in some pieces of Tangram with which they could construct the other two squares. So the visitors demonstrated the theorem in a very didactic way: playing with balances and playing with tangram. Students also learnt some properties of the cycloid and they could check its brachistochronic characteristic. I imagine Galileo or some of Bernoulli brothers in the 17th century doing the same experiments with a similar instrument. What a wonderful curve! The ball always reaches the central point in the same time and its initial position doesn’t matter! Another of the studied curves is the catenary which is one of the emblematic mathematical symbols of Antoni Gaudi’s architecture in Barcelona. Of course, polyhedra are very important in the exhibition and visitors can play with them so they discover some of their most important properties. For example, which is the dual polyhedron of the dodecahedron? Playing with it the students could see that the hidden polyhedron is a… You must visit MMACA and discover it! There are more mirrors and more wooden pieces to play and construct other different Platonic and Archimedian polyhedra. And… did you know that it’s possible to draw a right line playing with two circles? If the red circle rotates within the black one… what figure is described by the yellow point? Rotating a circle within another one, he could move a point in a right line without denying Aristotelian philosophy. 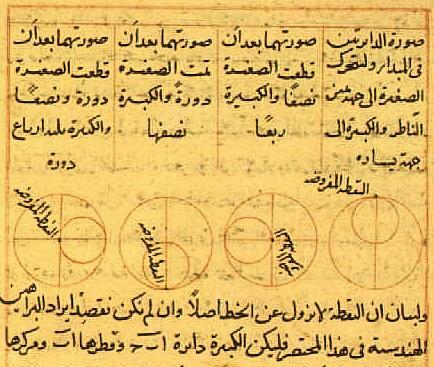 This dual system was used by al-Tûsî in his Zîj-i Ilkhanî (finished in 1272) and Nicolas Copernicus probably read this innovation together with other Arabic astronomical models. Thinking about them, he began to improve the astronomical system of his De Revolutionibus (1543). Al-Tûsî’s pair was very famous until the 15th century. I didn’t know that it could be described only with a multiplication table! Is its equation z = xy? Yes, of course! My students also played to build the famous Leonardo’s bridge and they could see that there isn’t necessary any nail to hold a bridge. Furthermore, one of the rooms of the palace is decoratd by a chess lover! So… you must go to MMACA and enjoy Mathematics in a way ever done!